Do you have good time management? Or are you like most people, frantically struggling to get all your tasks and activities done before the day is done, and left wondering where all your time has gone? Most people could use some help and improvement with their time management skills. 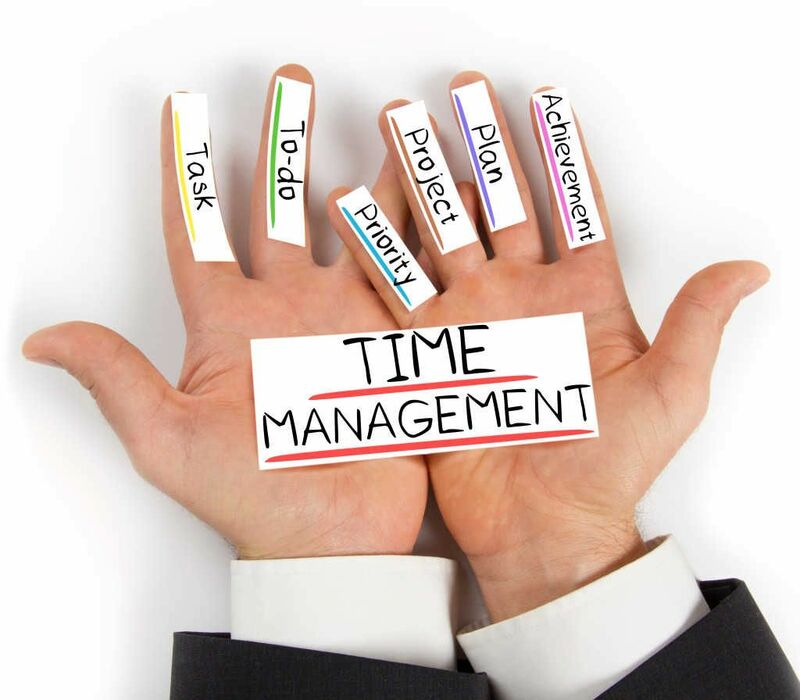 Those who seem most afflicted by poor time management include students (particularly those who also work full or part time), work-at-home parents, working mothers, and small business owners, although anyone can struggle with achieving good time management. Good time management starts with knowing how you spend your time and energy, analyzing it, and then making improvements. Record (roughly) how much time you spend on each major task or activity in your daily or weekly life. Take a look at it, see where you can make improvements, and then set goals to allot more time to things you value or to the things that require more of your time, and less time to those tasks and activities you don’t value or that don’t need so much of your time. Becoming more organized in general is another great way to achieve good time management. Organization can make all the difference in whether your life feels in control and balanced, or out of control and hectic. Identify where and how your life is disorganized, and set specific goals for improving your organizational skills and thereby aspire to good time management. Invest in some notebooks and calendars, a white board (along with a dry erase marker), and some different sizes of organizational containers (for laundry, toys, flyers and coupons, bills, receipts, etc.). Another way in which you can strive to achieve good time management is to identify and then eliminate time wasters or stealers. These are the things in your life that interrupt you, get in the way of your overall productivity, and simply waste your time. Time stealers can include interruptions such as phone calls, online chatting, and uninvited visitors. You don’t have to be on the receiving end, either; far too many of us are guilty of making the calls when we should be working, studying, or spending quality time with our family. Poor planning is considered a time stealer as well, as is procrastination. A further tip that may help you to acquire good time management skills is to learn to make your downtime productive. Most of us are the victims of “wasted” time on a day-to-day basis. Whether we’re waiting in line for 15 minutes with our groceries, stuck in bad traffic that ends up making us half an hour late for coming home, sitting through boring or annoying commercials, or sitting on the bus staring blankly out the window, it’s possible to make this time more productive. For example, if you’re waiting in line at a store, use your cell phone to make an important or neglected call. When you’re stuck in traffic, you can also use that time to make a call, or listen to a favorite book, music album, or stand-up comic on tape or CD. For commercials, use that time to tidy up the living room, fold the laundry, help your child with homework, check your e-mail, make lunches for the next day, feed the cat, or exercise. And there is plenty you can do on the bus while you’re waiting for your stop. Read a book, study for a test, start writing your next article, make to-do lists, make a call, or plan a party. As you can see, there is plenty for you to do to improve your time management skills and finally achieve good time management. All it takes is a little effort on your part, and you’re on your way to less stressed and more balanced life!